By now our regular readers understand what this blog is about. We’re here to encourage all writers, from beginners to journeymen, to make use of every venue available to promote themselves. Several of our recent posts have dealt with the emergence of e-books, a platform we strongly believe will become the norm in the near future. Whether you agree with that assessment or not, it’s important to point out that regardless of what publication method you choose, you must present a quality product to your reader. That, of course, has been the focus of the negativity regarding self publishing for years—that anyone can self-publish a book. It’s a valid argument. As a judge for a national self-publishing contest, I’ve seen hundreds of books that will never be read by more than a handful of people. Not because they aren’t good ideas or stories, but because they are poorly written. Think of writing as you would any other task. You have to do the prep work. When I painted my bathroom last month, I had to scrape off a lot of the old paint, after which I found numerous cracks in the plaster that also needed repairing. A big chunk on the ceiling just broke away. So I gathered the tools I would need for the job (paint scraper, flat sander, joint compound, primer, and moisture resistant paint) and set about fixing the problem. It took a lot more time than I had originally anticipated, but the end result looks pretty darn good. With writing, our prep work entails honing our craft. And make no mistake, writing is a craft. We must understand and be able to implement the basic concepts of storytelling: scene, structure, dialogue, theme, point-of-view. All of these elements must work together to move our stories forward in a smooth, non-intrusive fashion. In non-fiction, knowledge of your subject is key. I spent three years researching basketball for Hoop Lore, and I was already quite informed on the topic, having followed the NBA for most of my life. After gathering literally thousands of pages of information, I had to organize it all into a storyline that other fans would enjoy reading. The same was true for Elvis Presley, Richard Nixon and the American Dream. We can’t just throw a bunch of information together and call it a book. Not if we expect anyone else to read it. So learn your craft and hone your skills. Share your story with other writers (not family members or friends!) and ask for their honest opinion. Edit accordingly. Rewrite and rewrite again. Make sure your book is the best it can possibly be before you present it to potential readers. You’ll be glad you did, and so will your readers. This makes perfect sense to me. As a writing teacher, I see, at modest estimate, a quarter of my students with laptops or some other device with which they can surf the web, read online articles and books, and IM each other (naturally, while in class). Some students speak of Kindles their grandparents have bought them. When mandating a book report, I give them the choice of hard copies from the library (three minutes away on foot) or ebooks/burned CD books. There are other interesting reflections in this New Yorker article, including Steve Jobs’ claim–which he is certainly not the first to make– that “people don’t read anymore.” He said this right after noting that it really doesn’t matter how good or bad the product (book reader device or book?) is anymore. Hmmmm. “Forty percent of the people in the U.S. read one book or less last year,” he added. Aw, gee, break my heart. So 40% of 309 million people read one book or less. That leaves, what, over 180 million people who do read? As a teacher, I hear this all the time–“people do not read anymore.” My students, who are after associate degrees at the very least, tell me they don’t read while they are buying the ebooks they opt for because the campus library is so far away (three minutes, remember?). We have great conversations about those books in class. If these students do not see themselves as readers, who cares? Just so long as they keep reading–and I will use every trick in the book/ebook to make sure they do. 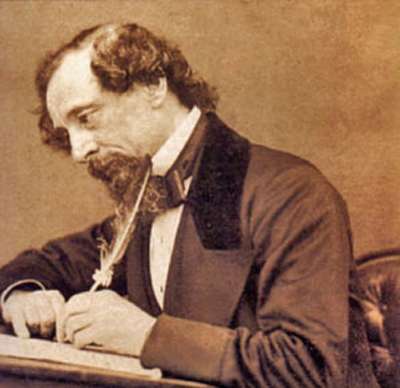 What kind of writer was Charles Dickens? Every so often, I come back to Charles Dickens (1812-1870). His tombstone proclaims him “England’s Most Popular Author.” He wrote about the frustrations every person endures throughout life, and the struggle of choices we face every day, making us who we are more than we know. I appreciate his caricatures of people at their most ridiculously hypocritical. Upon the background of well-plotted stories, he drew sharp silhouettes of the cheats, sycophants, and liars of society, hiding behind practiced smiles or haughty tones, and proudly sporting their titles of education, election or religion (the value of which is questionable given the widespread reliance upon whom-one-knows over what-one-can-accomplish). We recognize these same people, wearing modern clothing, in our own lives; we are bound by regard for our own well-being to treat the same with civility if not respect. To tell them our true opinions could spell ruin. That Dickens is struck by the same contradictions I see today and can make me laugh is tremendous stress relief. Dickens created his most vivid characters with this heightened comic appeal. For that, his literature is not considered top notch. He is the subject of few if any university classes even though the eminent BBC and various Hollywood producers have taken on production of his better known novels. Why? He was a popular writer. There is a big difference between what is taught as literature and the kind of writing that has popular appeal and sells well enough for writers to actually live off their earnings. 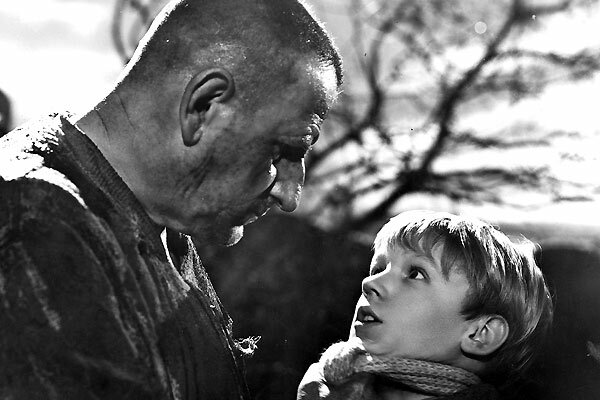 From the 1947 Great Expectations with Finlay Currie as Magwitch and Anthony Wager as young Pip. Oddly, Dickens was not (I will forever contend) a genre writer. Today, a few dozen genre writers are virtually the only ones who can earn enough from their pursuits not to need another job to live. Dickens was a popular writer, but not formulaic like the genre writer. His plots are unpredictable to the reader and even to himself as he wrote them. Dickens’s novels and characterizations hold my attention and delight me as most literary magazine stories I read do not. Yes, I have to make the leap backwards to another time and society, just as I help and encourage my readers to make the leap to Arabia in Under a Crescent Moon. I have tried, like Dickens, to depict characters readers will recognize from their own lives. No matter when and where, societies are mostly the same. *Julia Simpson-Urrutia is a professional writer, editor and college writing professor. She is the author of Under a Crescent Moon: Stories of Arabia available on Amazon.com. He rewrote the ending to Great Expectations after his first ending disappointed readers of the magazine installments. George Bernard Shaw thought the rewritten ending was “Psychologically wrong,” but “artistically more congruous.” What Shaw meant by the last comment was “more pleasing,” i.e., more to the popular taste. This time of year always brings out the best in me. The NBA playoffs—aka the “real” season—is underway! Don’t get me wrong; I enjoy each and every regular game throughout the league’s 82-game, six month marathon season. I hope the powers that be never shorten it, even though a case could be made for doing that given the number of player injuries that have mounted up this year across the board. But no matter. This isn’t the time to whine about who’s hurting and who isn’t—as the shorthanded Utah Jazz proved last night. Deron Williams, you are amazing, baby! Any chance you might want to wear purple and gold in the near future? (I’m talking very near future.) L.A. is a great place to live and play hoops, just ask Lamar Odom. But I digress. The point of this post was intended to focus on passion. You know, that heart-stopping buzz that takes over our senses when we’re involved in something we love. I have informed my blogging partner, Julia, who is new to my NBA nuttiness, to beware: I will not be myself for the next couple of months. 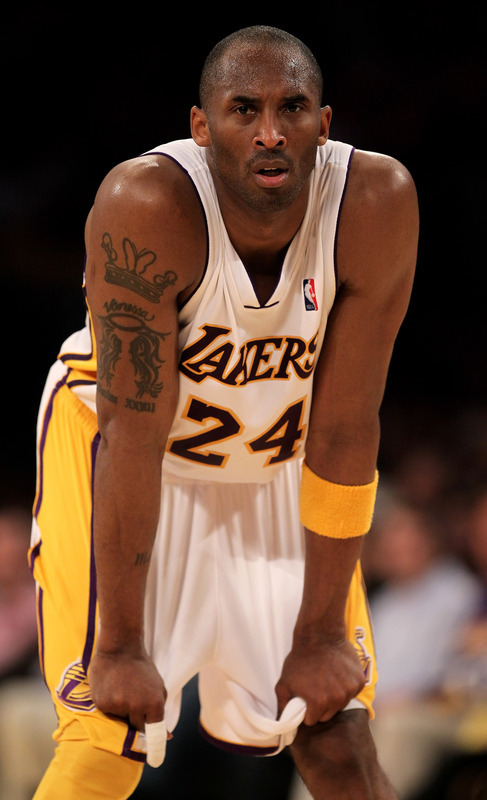 I live and breathe basketball from now until mid-June when, hopefully, the Lakers will repeat as World Champs. My husband has other expectations. He’s never been able to quite let go of the Seattle Sonics and is thus a Thunder fan. I can’t blame him in some respects. The Thunder is the team of the future. Just not this year. Kevin Durant’s time will come, but Kobe is the present Finals MVP and I know he will be again. Go Lakers! Ah, again I digress. I suppose I should apologize to our readers who aren’t NBA fans, but I’m not going to because the whole point here is to embrace your passion. That passion can be anything. Sports, gardening, hiking, animals, museums, collecting stamps. It doesn’t matter. Just feed your soul with something you love and it will make you a better writer. I guarantee it. Now get off this blog and go write something inspiring! When I began watching Judge Judy in the late 1990s, I became an instant fan—not so much of Judge Judy herself as the incredibly lame people who appeared on the show. I still catch the program at least a couple of times a week, usually via DVR. Among my favorites are cases involving women who have been burned by deadbeat guys—guys they knew were losers from the start (often via prison records). No matter how irresponsible and lazy the man, the woman suing him had, at one point, been living with him, hoping and praying he could be changed. The only change that occurred, of course, was the woman’s money moving from her own pocket into that of her lame-brain boyfriend and out the door, never to be seen again. I also enjoy the cases where parents show up to defend their children, making excuses as to why their 12-year-old, who broke a neighbor’s window while playing baseball, or ran into their parked car with a bike, wasn’t really to blame. Even worse are parents who enable their perfectly healthy adult children, allow them to live at home rent-free with no job or responsibilities. 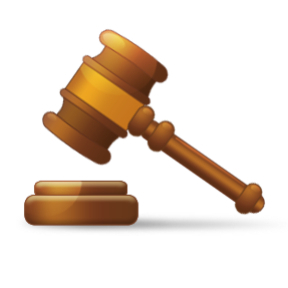 The latter are plaintiffs in various lawsuits: non-payment of child support; borrowed cars that were wrecked while driving without a license or insurance; payback of loans that they insist were meant to be gifts. The list goes on and on, and so does the show because, apparently, there is no end to the number of lame people willing to go on TV and show the world just exactly how lame they are. Watching Judge Judy helps me as a writer in several ways. The most obvious is that I get ideas for characters. Most of these people are way too pathetic to serve as main characters (what reader could take them seriously? ), but I have picked up some worthwhile material to use with my supporting casts. I also find the show great medicine for that affliction that hits us all from time to time: the writer’s doldrums. You know what I’m talking about: those depressing days when we sit around feeling sorry for ourselves because we have yet to land that six figure contract. When I fall into this trap, I abandon my computer for my TV, watch a few episodes of Judge Judy, and presto! I feel instantly better. Much better. It’s a relief to know there are people out there who have accomplished so little with their lives that they’re willing to throw away a lifelong family relationship to sue a sibling for fifty dollars. And in front of a television audience of millions, no less. Thanks for the inspiration, Judge Sheindlin. And keep up the good work. Several of Connie Kirchberg’s books can be found in the libraries of most major universities. She also serves as a judge for an annual writing contest sponsored by one of the most popular (and educational) writers’ magazines in the country, so I know she does not advocate self-publication lightly. More than half of the many books she receives and reads through with a conscientiousness humbling to behold should never have been printed, from a marketing point of view. While my friend does not mince words or lie, she finds positive aspects of each book to focus upon in the letters she writes to the authors, even as she lets them down as gently as possible. There is a reason for this gentleness. While, admittedly, some struggling writers need grammar, creative writing and several other college classes (plus the ability to listen), some aspirants do make tremendous leaps after lukewarm beginnings. One of my students comes to mind: she wrote a book about her brother, full of love and spiritual faith. It was a hodgepodge of emotion, jumping from the loved one’s death told twenty times over to the same spiritual epiphany preached at the reader. Her class essays demonstrated a struggle towards control, and slowly, she won. In the next semester, she continued the ascent: her play was chosen as one of the few in a play-writing class to be staged for the public. Let it be understood that every book must be appraised separately to determine whether an agent should be sought, if the book should be sold to a small publisher or self published. The decision must have to do with the overall impact on career and finances. Let it also be understood that neither Connie nor I advocate self publishing unless a writer goes through all the traditional steps, as a writer, to achieve excellence. These steps have rightly been called a baptism by fire. We do not see that changing. I’d been writing seriously for a few years (back in the early 80s) when I first heard about vanity publishers. I learned of them from the vanity presses themselves, though they were great at disguising who and what they were. “So,” the lead-in would read, “you’ve written a book. We’d love to read it! We’re sure it’s the next Gone With The Wind,” or something like that. Their point was to heap praise on a writer they knew nothing about. They had no idea if I could write any better than the average person off the street, but so what? If I had a finished book I hadn’t yet placed with an agent or publisher, they wanted to be that publisher—for a price. A very large price. Of course that information came later, after they had suckered you into sending them your manuscript. I never sent any of these people my money, but obviously thousands of writers did, or these places wouldn’t have remained in business. Sadly, the vanity press syndrome continues to haunt us. By syndrome I mean the stigma that has attached itself to writers. Those of you who read this blog regularly know our core message is that all writers, published and unpublished, must become experts at self-marketing if they hope to sell their work. The way we become published today has little effect on sales since publishers no longer budget for marketing. The industry is on the verge of a total makeover. Fewer and fewer new books are being sold in hardcopy print. E-books will be the norm in a few years. There are numerous reasons for this, but the most pressing one is, as with all businesses, cost. Which brings me to the bottom line of today’s post: no one cares who published your book anymore. The number of on-line publishers is dazzling, and so are our choices as writers. We can opt for putting our books out strictly in e-book form, be it Kindle, Sony Reader, Apple’s new iPad, or simple PDFs as Julia and I use on this blog. We can contract with an on-line publisher and receive hardcopy books within a couple of weeks (or in some instances, days). We can burn our files onto CDs. We can do all of the above, none of which is remotely related to the concept of a vanity press. We, the writers, are choosing our own paths, not dropping our work into the hands of uncaring, money-grabbing cheats who promise us the moon and the stars and instead deliver a wet box of sparklers on the 5th of July. Readers may prove slow to adapt to all the changes going on, but they’re still out there, waiting for us to entertain, enlighten, and inform them with our work. As you develop your own strategy for delivering that work, don’t buy into the dribble that self-publishing is the curse of death. On the contrary, it’s a fresh blast of cool spring air that will invigorate you to no end.